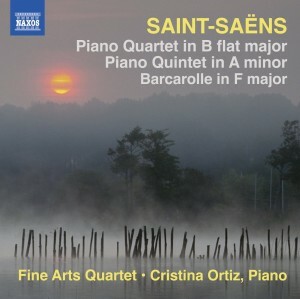 Saint-Saëns holds a vital place in the history of French chamber music. At a time when his compatriots were more devoted to opera and song, Saint-Saëns (who wrote both, too) repeatedly produced chamber music of compelling individuality and lasting significance. The 1875 Piano Quartet in B flat major, Op 41 remains one of the great works in the chamber repertory, a masterful example of the composer’s organisational skill and lyric gifts. The gorgeous Barcarolle is followed by the youthful Piano Quintet in A minor, Op 14, a brilliantly confident work with a concerto-like rôle for the piano.